Keep your paws toasty warm and dry with the new Fall Line II Mitten from Gordini featuring Megaloft insulation for superior warmth and Aquabloc waterproof/breathable insert.FEATURES: 3 layer thermal ply waterproof windproof breathable fabric Stick-grip fingers wrap caps and thumb Digital-grip palm and reinforcement Megaloft insulation with Hydrowick microdenier lining Ultra breathable waterproof windproof Aquabloc insert Gauntlet cinch closure Nose wipeAquablocAquabloc is Gordini`s proprietary waterproof breathable windproof technology. 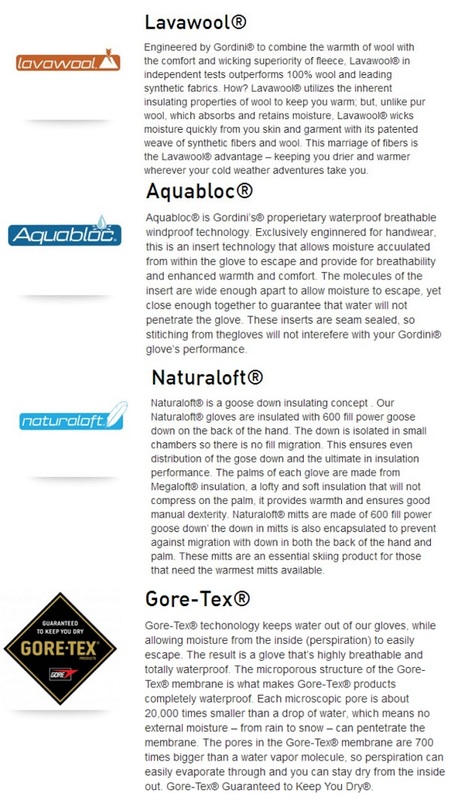 Exclusively engineered for handwear this is an insert technology that allows moisture accumulated from within the glove to escape and provide for breathability and enhanced warmth and comfort. The molecules of the insert are wide enough apart to allow moisture to escape yet close enough together to guarantee that water will not penetrate the glove. 3 layer thermal ply waterproof, windproof, breathable fabric, stick-grip finger area, wrap cap and thumb with digital grip palm and reinforcement. Megaloft®, Aquabloc®, gauntlet cinch closure, nose wipe, wrap cap, palm and thumb reinforcement.